Western North Carolina has many defining features, but none are more iconic than the ancient Appalachian Mountains. These mountains provide a bounty of natural resources, such as fine hardwood timber and headwater sources of drinking water for millions of residents here and further downstream. It also provides an aesthetic profile of ageless beauty for our region that is recognized around the world. It is no surprise that the mountains continue to draw more people to this region to live and work. Growth and development in this mountainous region requires special skills and knowledge to prevent damage to fragile ecosystems and sensitive view areas. Understanding steep slope stability issues, in particular, is key to successful development. While many steep slope areas are stable and safe to build upon and, conversely, some lower slope areas are problematic because of highly erodible soils, ground-disturbing activity on the steepest slopes (those in excess of forty percent) warrants extra caution. In addition, rates of erosion increase significantly as slopes increase. Vegetated buffers and other strategies for mitigating impacts from erosion on mountain streams are less effective on steep slopes. 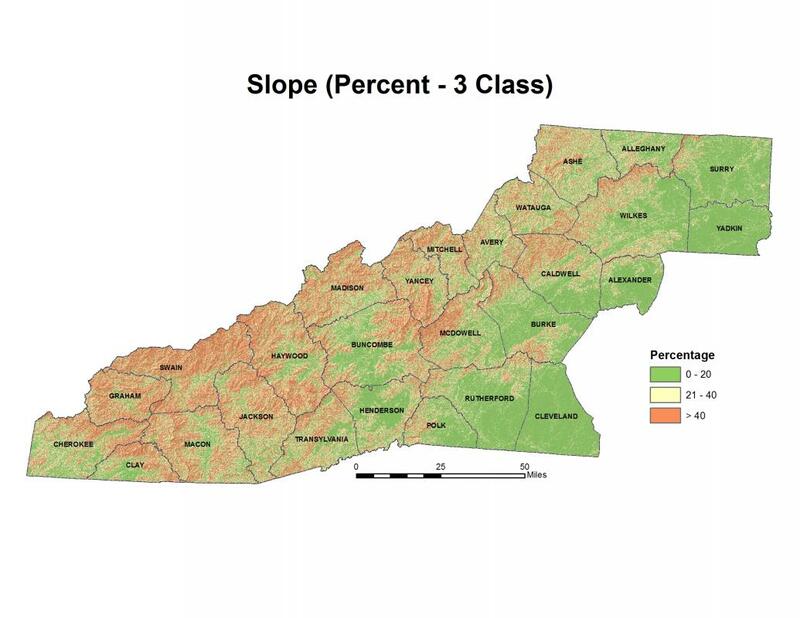 The result is the potential for negative impacts to headwater streams in Western North Carolina, where our western streams and rivers originate. 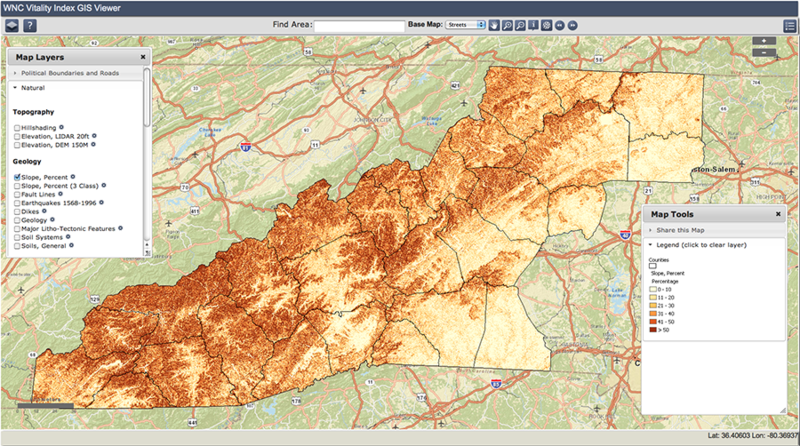 For an interactive, scalable view of the slope map for the Mountain Resources Commission region, please access our GIS Viewer here. To access the slope maps, click on the Natural tab in the Map Layers window, then click the box next to the layer you'd like to add to the map (i.e., "Slope, Percent"). The transparency of the layer accessed can be changed by clicking on the gear next to the layer name and using the slider that will appear in the pop-up window. Wooten, R.M., R.S. Latham, A.C. Witt, K.A. Gillon, T.D. Douglas, S.J. Fuemmeler, J.B. Bauer, and J.C. Reid. 2007. 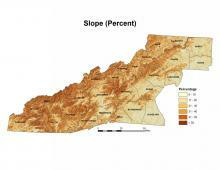 Landslide hazards and landslide hazard mapping in North Carolina. Water Erosion Prediction Project. Accessed from: http://milford.nserl.purdue.edu/wepp/weppV1.html. Wegner, Seth. 1999. A Review of Scientific Literature on Riparian Buffer Width, Extent and Vegetation. Institute of Ecology, University of Georgia. Accessed from: http://www.chathamnc.org/WatershedReviewBoard/supporting_documents/stream_buffers/LitReviewRiparianBuffers.pdf.